Friday night I was in San Francisco seeing Jake Johannsen. I was driving home on I-280 at about 10:30. It was rainy weather. At one point, the traffic slows down to a crawl. There is a police car ahead, blocking traffic and ensuring it only goes 15 mph. I had no idea why, but after about a mile, I see all the snow piling up on the road. 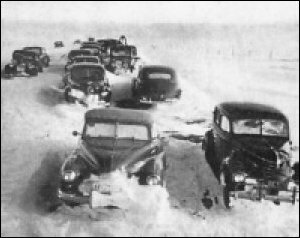 Californians in this area have no idea what to do in snow, so it was probably a good idea to keep all the cars going at 15 mph. People never believe me, so here's an article from someone more reputable. Glad to hear you made it home safe and sound. I would have missed you terribly if you had slid off the highway into Halfmoon Bay. Please remember to keep a life jacket in your car and a set of chains in your trunk for future treks to and from the city. First time poster, long time PhotoPage user (since 2001). Been keeping up with your adventures throught the years. A couple of weeks ago, I did 9 hours on a normally 2 hour stretch travelling through Arkansas. Inch of ice at 20 degrees mid-day. It did not melt that day. Got caught in a freeze, but HAD to get through to meet a deadline. When I hit the Tennessee border, I was soon going 65mph on salted, dry roads the rest of the way. Amazing what spending a little more money on the roads will do. Did you know it is now April 27th? Isn't it time for a new post? Has nothing of interest transpired in your life since March 12th? Gimme something! I'm bored reading about the snow... It was cool the first time I read it. Even kind of funny up until around March 17th. Now it's just old news. Covered with dust and buried under a mountain of Snickers wrappers.